We don't usually make a big fuss of Valentines Day here... although hubby was sweet enough to come home with a new pair of sewing scissors today. 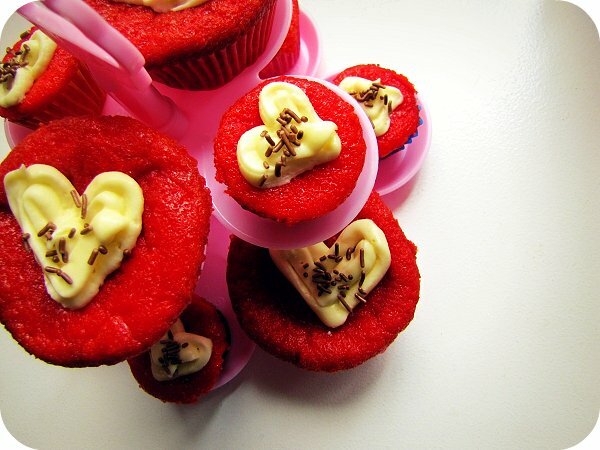 We did have a little Valentines celebration with the kids after school though, finishing off the Rainbow Cake and some Red Velvet cupcakes (recipe coming soon) from yesterday, and making sure they all knew that they are precious and loved much. Wow! You are on a baking kick aren't you? Rainbow cake AND these? Miss 4 had a glam birthday indeed! New sewing scissors! Now that's the key to a women's heart. How He Loves us is one of my favorite songs. God sure knows how to say "I love you!" My son helped me open the bloggy love parcel I received and was very excited by the hearts in it. We're not doing valentines as hubby is working away for the time being. Happy Valentine's Day! Those cup cakes look divine. We sang this in church yesterday. What truth! And I love the final statement you made. Perfect! happy hearts day (albeit belated)! Beautiful cupcakes, and beautiful sentiment...He can fill any void.